The Abductor's Quarters is an Eamon adventure written by Jim Jacobson. The Abductor's Quarters is Jim Jacobson's fourth adventure, following The Devil's Tomb. As with his last adventure, here the setting returns to a more traditional underground dungeon, without the wilderness seen in The Zyphur Riverventure; however, The Abductor's Quarters is the first Eamon to employ a small maze with no visible exits and the need for the player to find ways through via trial and error, similar to those more famously featured in Colossal Cave Adventure and The Zork Series. The adventurer's friend Kathryn is kidnapped by the Abductor, a villainous rogue adventurer who is lord of his own underground dungeon complex, the aforesaid Abductor's Quarters. 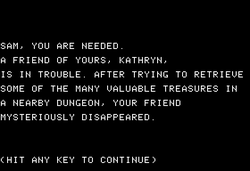 The adventurer heads in to rescue Kathryn and put an end to the Abductor's plans; however, soon after entering the dungeon a rock fall blocks the entrance meaning that it's also necessary to find a way out. This will mean contending with a complex of dark and confusing underground passages, the Abductor's guards, a contentious bandit, and several magic items, including two unique magic swords. Eventually, however, the adventurer will come to the throne room where the Abductor himself waits with his thuggish minions. Once overcome, however, the adventurer is free to search for the way into his dungeons where he/she can find his/her kidnapped friend, as well as several treasures looted by the villain. As with the other Deluxe versions of Jim Jacobson's adventures, Frank Black has made significant additions to the play. Some of these take the form of alterations in description, such as the "Guard 1" and "Guard 2"-type enemies in the original being altered to be more amusing. Others involve smoothing over some rough edges, such as the bandit encounter which in the original adventure involves the player's money being unavoidably stolen by a bandit; now one can reclaim it after reaching the Abductor's vault. Black also replaced five rooms to the program which appeared in the original code but were not used in the game, and added some appropriate treasure items to them, though still (as with the original) most of the treasure is found in the Abductor's vault. The Abductor is also said to have kidnapped several friends from previous Jim Jacobson adventures, too. Tom Zuchowski gave the adventure a rating of 6 and praised its special effects, though he thought it a hard play especially given the amount of exploration found in the game. Luke Hewitt was less impressed with the Eamon Deluxe version, giving it only a 4-10, since while he appreciated the specials he disliked the lack of colourful descriptions in the background. The Abductor is said to be a mad adventurer wielding an extra sharp Trollsfire as his weapon. Trollsfire is the sword found in The Beginners Cave. The Abductor also appears again with a fresh underground base in Frank Black's Fiends of Eamon. As with the rest of The Jim Jacobson Adventures Deluxe, companions from previous adventures return. Prisoner Thirteen from The Zyphur Riverventure can be found wandering the halls, while the Chef from The Cave of the Mind and the Eamon Deluxe character A.J can be rescued from the dungeons. The Abductor's quarters are said to be underground, but—like many such locations—it's unclear where they actually stand in relation to the Main Hall. However, a bandit who steals the player's money is said to be from "Frukendorf," a town ruled by bandits, and later revealed in A Runcible Cargo as the location of the Bandit's Guild. This combined with the use of a Trollsfire sword by the Abductor suggests that the Abductor's base is comparatively close to the Main Hall.